Today we are interviewing L.B. Johnson, author of "The Book of Barkley - Love and Life Through the Eyes of a Labrador Retriever." I write as a way to capture so many things around me. Working in a law enforcement related field, looking at everything in great detail is a big part of my day. I’m a wife, a rescue dog Mom and a licensed commercial airline pilot. The book has been described as memoir, pet essay and eulogy. In a way it is all three, my story of growing up, dealing with both loss and grief too young and how loving and being responsible for another living thing, literally changed how I viewed the world. This book will resonate with anyone who has love or lost, not only two legged friends and family, but four legged. What inspired you to write a book about your relationship with Barkley? Barkley passed away at the same time as my only brother, both to sudden, aggressive cancers. I wrote The Book of Barkley to capture both of their stories, so others could learn to love and live as they did, even as they remembered them. Can you tell us about the first time you met Barkley? He was just a puppy, sitting down at my feet and not leaving my side while his brothers and sisters gave a quick sniff and then went back to play. I think he picked me as opposed to the other way around. What was it about Barkley that allowed him to have such a positive impact on you? Barkley, as dogs do, didn’t judge or act based on experiences, prejudices or former pain. He just looked on each day as a joyous gift, loving everyone around him unconditionally. That was something I think we all need to learn. 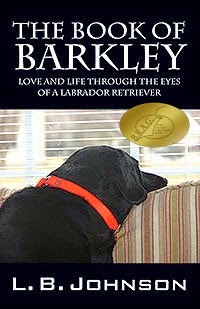 In the book, you talk about how Barkley pulled you from the depths of grief and despair into a life chock-full of love. Can you compare what your life was like before and after meeting Barkley? I lost three people I loved, in different circumstances, before I was even an adult. Finishing my education and getting a great job was exciting but it was incredibly lonely. I figured if I didn’t let anyone too close to me, they couldn’t hurt me. Barkley changed that, introducing me to laughter and trust again and inevitably, bringing the man that is now my husband, into my life. Readers seem to have a strong response to reading your book. What is it about your journey with Barkley that resonates so strongly with readers? Loving a pet is almost a universal response. We see ourselves in them, we put so much trust and joy and hope in them. When they leave us it is heartbreaking, yet we usually go out and learn to love again. For much of society pet’s aren’t just an animal that shares our home--they are family. You’re involved with animal rescue and non-profits that help service/search/K9 dogs. Can you tell us a bit about your involvement and what inspired you to get involved? Every cent of royalties of "The Book of Barkley" is donated to animal non-profits such as Search Dog Foundation, Kevlar for K9’s and dozens of small community rescue groups. Even the smallest bits of support may make a difference in an animal’s life. My second book “Saving Grace – A Story of Adoption” is being published by Outskirts Press in May of 2015.
hope it is the joy that stays with you.